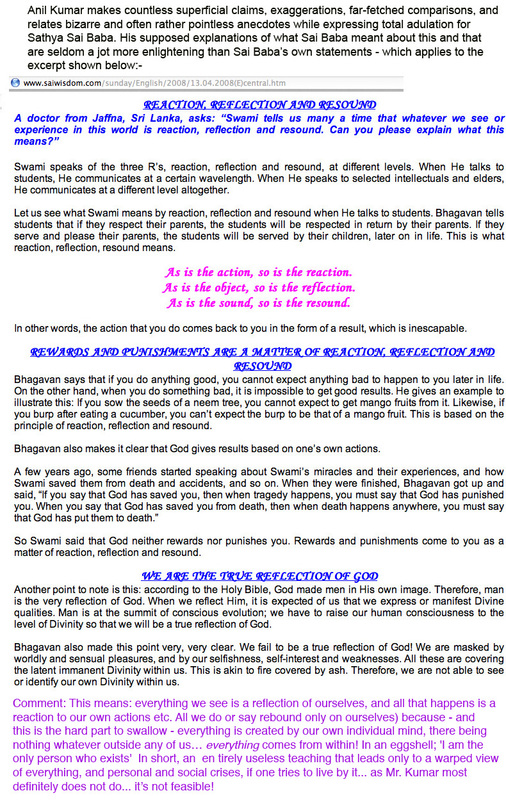 Reflection, reaction, resound explained by Anil Kumar? Indeed, this sounds most hollow when it is realised that the good Anil Kamaraju Kumar is known to be a philanderer and to have kept a foreign (Finnish) mistress, while married and serving his Lord and Master, who insisted on celibacy… See: Professor Anil Kumar, Sathya Sai Baba’s ‘left-hand’ man. Enough said as to word and action in Mr. Kumar’s ‘spiritual practice’! Anil Kumar of Sathya Sai Baba infamy continues to deceive himself and others Still blustering – his Besserwissen arrogance shining through his false humility – he continues to defend one of India’s most untruthful, calculating and degenerate claimants to be the God Avatar of the Age, even after all that has come out to disprove and discredit Sathya Sai Baba. The Latest Example of His Master’s Voice Brian Steel analyses the role of Anil Kumar in Sai propaganda and disinformation. He points out that, however bizarre some of Kumar’s offering may sound, they are accepted without demur by most devotees as accurate and authentic pieces of the SB story: in other words, as officially endorsed. Much of the SB legend has been strengthened and sustained in this indirect way. Professor Anil Kumar’s interview with the Thailand media – 1 Anil Kumar Kamaraju (a former botanist) had close access to Sai Baba as his interpreter etc. He is living on the memory of Sai Baba, and – with his small band of servile helpers – is obtaining money from lecturing to the remaining flock of devotees around the land. Professor Anil Kumar’s interview with the Thailand media – 2 Anil Kumar exhibits his overwhelming gullibility as an endorser of Sai Baba’s impossible claims. Interview with Professor Anil Kumar Thailand media 3 Anil Kumar Kamaraju confirmed that the British architect Keith Critchlow, who was close to Prince Charles and designed the super-speciality hospital in Puttaparthi, advised the Prince to visit Sai Baba. And Charles was said to be keen to make the trip. Professor Anil Kumar, Sathya Sai Baba’s ‘left-hand’ man Professor Anil Kumar is one of Sai Baba’s most trusted accomplices. He is a married man, but is also accused most credibly of philandering, and with Sai Baba’s permission too! The Latest Example of His Master’s Voice Brian Steel writes of Anil Kumar’s web-published unquestioning endorsements of SB and his Divine claims (but also of his boastfulness and his peculiar anecdotes). Steel shows excerpts of Kumar’s claims, exaggeration, far-fetched comparisons, adulation,which are completely transparent as to require no comment. Anil Kumar’s outrageously flowery and exaggerated descriptions entirely comes to a standstill in the privacy of his own home. When I went a number of times to the teacher’s quarters across from sb’s parent’s burial site on Samadhi Road where he lived, to ask sticky questions about sb’s senseless words in discourses (he was often in the company of several ardent admirers), Anil Kumar only said, “I have no idea why he said that! NO IDEA!” The silence would be deafening as I waited for the characteristic poetic surge that I thought would follow, but never did. In addition, I was asked on numerous occasions by my long-time acquaintance SH, to transcribe Anil Kumar’s fantastically fictional talks so they could be published on that website by her long-time boyfriend LG. Apparently (and amazingly?! NOT) they cannot find enough people willing to spend time on that lofty service, so SH often has to do it herself. SH and LG often go along (at their own expense) with Anil Kumar when he is invited to various places to talk about sb, to set up the audio and video equipment. One wonders just how many people bother to go to the site and read those talks. This entry was posted on February 4, 2014 at 3:24 pm	and is filed under Sathya Sai Baba. Tagged: Dr. Anil Kumar, Professor Anil Kumar, reflection resound reaction. You can follow any responses to this entry through the RSS 2.0 feed. You can leave a response, or trackback from your own site.